Its quite unlike me to indulge too much in the ales of the Shire (although it is highly like me to indulge in dwarf ale!) but today I did just that. I tried a number of the different beverages on offer at the Green Dragon before watching the most engaging of firework displays at the Methel Stage in Bywater. Of course, one drink led to another. And another. And I soon found myself stumbling across the Hobbiton bridge and towards Bag End. Now, although my brain may be somewhat addled due to the brews consumed, I did recall enough of my dwarven history to know that today was the day in history that Thorin and Company arrived at Bag End, to enlist young Bilbo Baggins and head off to reclaim the Lonely Mountain. With this in mind, I paid a visit to Bag End in homage to this great occasion. My stumblings soon convinced me that I was a little too drunk for a trip to Erebor myself, but to stand at the scene of the meeting filled me with great honour. Pashwise Honeyleaf, hobbit of the shire, here. Tonight I spent the most pleasant evening at the Bird and Baby Inn in Michel Delving. I have had many a fine night here, infact once upon a time I used to spend every evening under that particular roof, passing the time by sipping fine ale and discussing the comings and goings of the westfarthing. Of course, in those days I had little knowledge of the lands outside of these borders. Indeed, I would get scared at the prospect of walking to ummm Scary! That was before my beloved Poppyjay departed on a foolhardy errand to Bree and beyond. Well what choice did I have but to follow her! Its true that a few tears were shed that day when I raced out of the Bird and Baby calling her name and vowing to act as her protector. Not least because I had not even finished my pint of ale! Anyway thats another story! Since then I have spent most of my nights sleeping under the stars, whether in Breeland or Ered Luin. 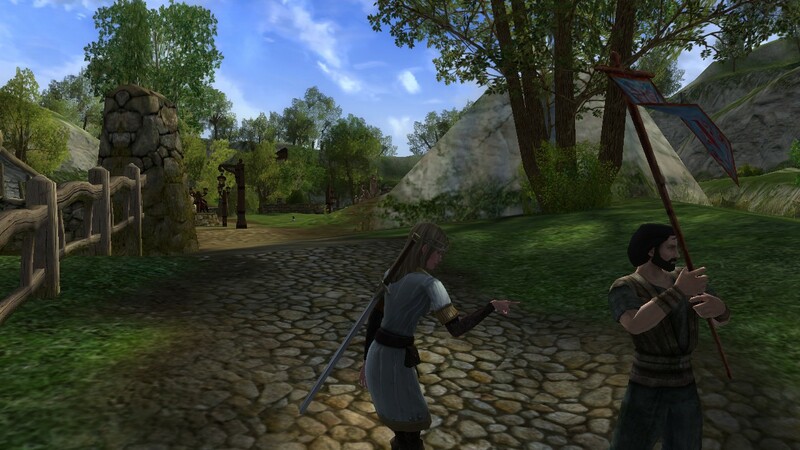 Poppyjay has even travelled to the Lone Lands, and being her self-proclaimed guardian I shall have to follow. But before heading off I decided to visit my old haunt once more, and have a few pints of Blagrove’s Brown with my old friends. However I soon tired of their endless mocking, as they constantly reminded me of my tears of anguish when I first heard that Poppyjay had left the Shire. Chubby Bunce was particularly cruel, insisting that he had thought it was for the best, particularly as my rapid disappearance had left him with a free jug of ale! 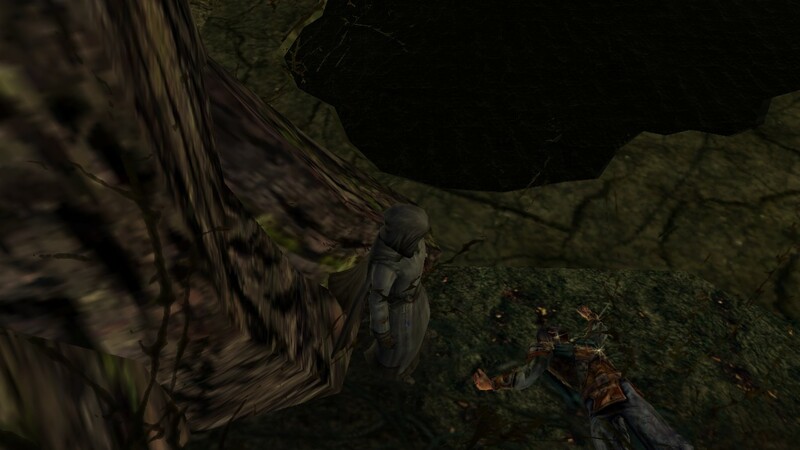 Making my excuses, I sloped off to the back of the Inn, an area that I had generally steered clear of. The gathering there told some frankly disturbing tales of troubles further afield. 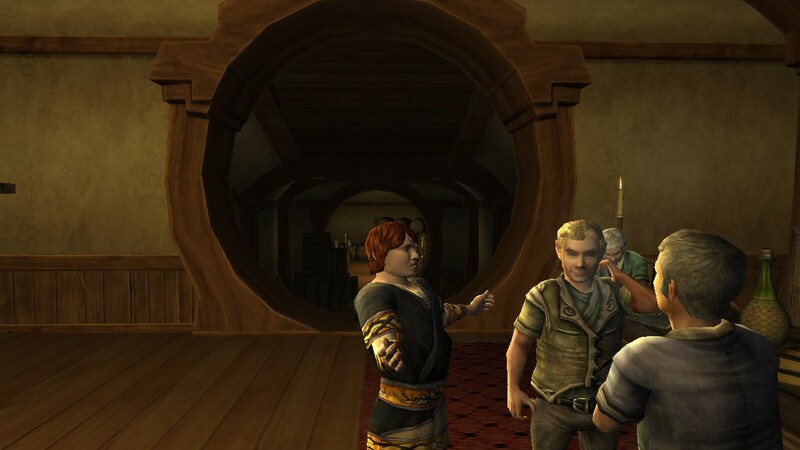 Being now more of a hardened adventurer myself, I decided to approach them and spent a fine evening embroiled in discussions surrounding my own travels. Indeed, they certainly understood the art of storytelling, and were soon adding much poetic licence to my stories and they made me feel quite the hero. Their names were Owen, Carlo and Jack, and I will long remember their company. At the end of the evening, they insisted that we raise a glass to their dear friend Ronald Dwale, who was detained in Dwaling – and on his birthday too! Following a toast to “the professor” (as they called him), I bid my farewells, and I departed feeling far more positive about the journeys ahead. Afterall, I am sure Owen, Carlo and Jack will be able to make quite a tale out of it! Well I never! I have only gone and won three beautiful new horses, garments to match, a beautiful pocket stone and maps to some very interesting areas within Middle Earth. It is true that, being a burglar by profession, I am often subject to moments of gambling, but I have never been the luckiest of hobbits. Infact most of my life has been one of outright failure where competition is concerned! The nearest I ever came to victory previously was when I won second place in Farmer Maggot’s “strangest shaped mushroom” contest some years back. I was pretty sure that I had grown the strangest looking fungae that had ever grown in the Shire, but I completely underestimated the effort from one of those young Bracegirdle lasses from Hardbottle. I guess that hers was at least edible! Anyway, all that is now a thing of the past. 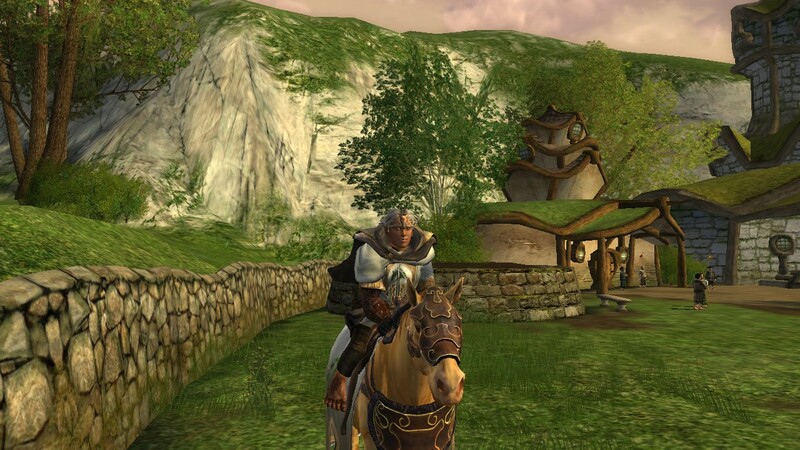 I have a good mind to hop on one of my new horses, maybe this nice Westfold one, and start to make my way towards Dunland and beyond. It will of course mean that I am unable to make my usual annual journey in Frodo’s footsteps, but from what I can gather my most dear wife Pashanor was spotted pacing up and down Bagshot Row with a very scary looking scowl on her face, so that was probably going to be a non-starter anyway this year. Besides, I have promised myself that I will spend this year’s fall in the shire, as I always miss that festival. Here’s hoping that my luck continues! Pashanor Proudfeet here. It has been exactly a year since I last saw my husband Pashbo. He disappeared on one of his adventures, to follow in the footsteps of Frodo Baggins a year ago today, and he has yet to return. Now myself I am not really one for adventure, I am much happier singing, or baking. That said, my travels to find my wayward spouse has provided me with a few moments of unwanted excitement! I guess part of me has enjoyed it. No, I can’t let myself think that way! Anyway, I came here to Bag End today, quite expecting Pashbo to return. I even had a frying pan at the ready, to give him a much deserved pelt around the ear! Now, you see, it is the anniversary of Frodo starting his adventure from this very spot, and I know that Pashbo has always tried to spend the day here. And then all the excitement of travelling takes him over, and he disappears from the Shire for months on end. I have sat here for hours, and there has been no sign of him. I guess I’ll wait here a while more. Although I am getting somewhat sleepy. He is a very selfish old hobbit – I have no idea whether he is even still alive. Although whatever monsters he has seen on his travels will not prepare him for the sight of this angry hobbit awaiting him on his return! That is, if he ever does return! Sometimes I just wish I could call upon my Westfold horse and gallop off in to the distance! I am sorry to sound so harsh, but sometimes being followed can frustrate me when I want to be alone. I am Pashwyl Calenard, captain of Rohan. It was a difficult decision for me to leave my people, but I am a young woman with much of the world to see. And these lands are so beautiful, despite the evil that tries to spoil so much of the ground that we tread. My own company is something that I enjoy. Not that I do not like people – nothing could be further from the truth – but I prefer such encounters to be shared amongst the many inns that I have discovered on my travels. My problem is young Bert. A fine and brave herald that first caught my eye whilst I was visiting the Shire, home of the little folk. I know not why Bert was there (maybe he was following me before that – I did often feel a presence behind me as I took the long path from Archet). Since we spoke in Michel Delving, he has barely left me alone. I fear that he has fallen for me somewhat, and is at my side more often than my own shadow. I should not be ungrateful, for he has often provided great assistance to me in battle. Indeed I do often cruelly demand him to fight on my behalf and, bless him, he always charges forth to defend my honour. But he can frustrate me at times, often trying to battle two or three foes when I only commanded him to attack one, putting both of us in great danger. He is also so very jealous! 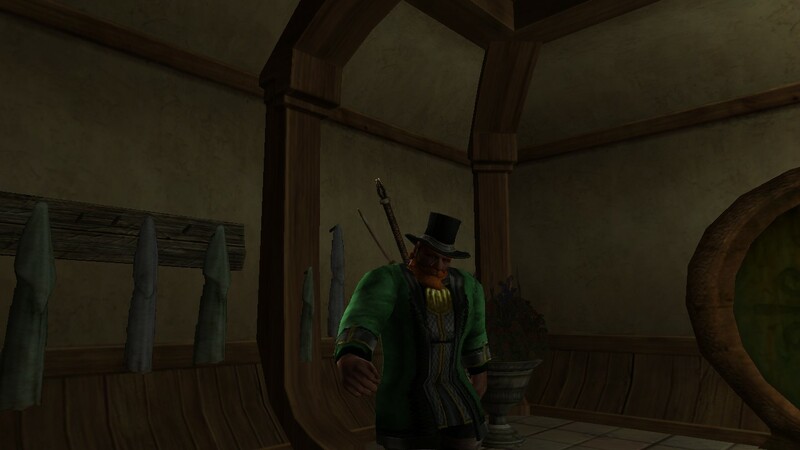 He knows that I have a love of music, yet whenever I speak to a bard he disappears to sulk. I guess I should take the opportunity to quickly ride out of town, but I would not have the heart. I would not want to hurt him, and although I complain I do find the need to call him back on those rare occasions that he does roam elsewhere. I just fear that he will end up being hurt, as I do not share the same feelings as he seems to have for me. For that reason, I have not yet called upon my horse.